The book is taking shape. Slowly, but it’s coming along. For the past few months I’ve been working on digitally pencilling the book. It’s a tough stage, but rewarding, moving from the quick and rough sketches created in the thumbnail process to pages that are close to how they’ll look when the book is finally done. Compare below the move from thumbnails to pencils. Pencilling offers a nice balance of looseness and accuracy. I can sketch out an image not having to worry that it’s perfect – letting scratchy lines show and any small mistakes remain in place until they are finally corrected in inking. At the same time, I’m getting things right when I can – putting time in getting perspective and anatomy right, making sure that it’s all going to come together when I come to ink. In these ways, each page ends up looking something like finished, while still retaining a scrappyness that means there’s still room to improve later on. Having moved to my iPad for some of the pencilling, the greatest boon has been the perspective tools built into ClipStudio. These tools allow me to throw together scenes in a way that had never been easy of possible before, freeing me to get more adventurous with perspective and offer more of a sense of place in my backdrops. There’s still a long way to go on pencils, I’m afraid. I’ve done about 60 of 160 pages so far. It’s been a lot slower than I’d expected and wished, and I’ve long passed the deadline I’d aimed for way back at the start of the project. It’s frustrating but I think worth it – my expectations had been based on Filmish, where I could pencil 3 or more pages a day. Life has changed since then – I’ve got two kids and more responsibilities than I did five years ago. And the standard I’ve set for these pages is higher – with more adventurous imagery and a new set of challenges in illustrating the medium of games in my comic style. After writing comes possibly the most crucial stage of all. Thumbnailing takes the script I’ve written and turns it into a very rough draft of what the entire book will be. I start off with the script infront of me, working through it page-by-page to establish how the pages will lay out in the book. Unlike a prose book, where text flows from page to page without any thought by the author, comics are paced panel-to-panel and page-to-page. What this means is that while in prose a sentence may be split across a page-turn without any effect on the reader, in comics the page-turn is a significant part of the reader’s experience. In comics, page-turns are often used to help signify a change of scene or time, and most artists attempt to hold back any shocking visual reveals until after a page turn. There’s no tension in looking at a character on a left hand page when in the corner of your eye you can see them getting eaten by monsters on the right hand page. In the case of my non-ficiton work, I try and pace pages so that each page spread covers one topic, and so that any page turn moves us on to the next part of the argument. Of course, the scripts I’ve written don’t always play along with this idea. It’s my work at the thumbnailing stage to break down the script so that the pace of things is satisfying, and so that pages that belong on the same page-spread end up together. Sometimes that means adding in big splash pages, while others it means splitting a page in two. Fortunately in this case, I rarely had to meddle too much – sometimes simply starting the chapter on a left or right hand page was enough to establish the right pacing so that every page ended up facing its natural mate. From here I began work on actually visualising the book. In a sketchbook I would measure out small versions of the page spreads. Then begins a visualisation process, involving further research into the time-period, locations and people I’ll later be drawing. It’s a fun process, and with this project it was great getting to research a number of iconic 20th century eras for fashion and decor ideas, as well as all the evolving technologies of the era. It’s not just the visual content either. I also need to work out roughly how the panels will sit on the page – how many I’ll need, and how they run together in relation to the text. It’s really important to get this to a satisfying level now. The further down the line you realise panel-to-panel or page-to-page pacing isn’t working, the more work you’ll need to redo. At this point in the process I’d often find myself stuck trying to lay out a page. A realisation I quickly came to was that if I was having trouble visualising the page, then there was likely something wrong at the script level. I’d often find that this was the best way to spot a flaw in an argument or a point where I was repeating myself – in trying to draw it all you quickly realise where your words are failing to do their best work. In all it took two months to thumbnail the book. It felt like a mountain of work, but it was hugely satisfying to see it come together. Words becoming pictures, the book becomes more real in my mind. I can see all the places where I made decisions I wasn’t sure would work. All the places where I struggled to get things right. And now with pictures in place (rough ones that now need fully realised) I can see how it all works, how those decisions were the right ones. It’s a good feeling. Writing was slow, difficult. I got to the end of the writing process exhausted. A little lost. The first draft clocked in about 40 pages too long. And it seemed like a mess. The structure felt incoherent, repetitive, rambling. And yet everything seemed immovable. A chaotic house of cards that I didn’t want to disrupt in case it came tumbling down. I sent it off. Took some time away from the book. And when I came back something had changed. I thought it was going to be impossible to cut 40 pages: everything seemed so crucial and intertwined. But these fresh eyes saw something different – I felt free to cut whole swathes of the book, juggling sections with ease. I’d been too close before. a mechanic wedged between the cogs of this monstrous machine. Now I was seeing it from the outside – a surgeon more than willing to lop out a spleen if it would make the patient better. It felt good. Within a week the book had shed 40-something pages. It was lean now. The things I’d cut were never missed. And I’d even had a chance to add stuff. Details worth sharing, ideas that had floated loose for too long now finding a home. Summer’s over and I’m back at this thing again. It’s finished, although it’s not. At least I know the book will work. Now I just need to draw the damn thing. The last few months have been some of the most creatively challenging of my career so far, but finally I have a first full draft of the Gamish script to show for it. At the start of the writing process back in around May 2017 I had only an idea of what interested me in game design and theory, a decent idea of the book’s structure, and an optimistic view that I could be finished a first draft in a few months. But finally sitting down to research and write, it quickly became apparent that this was going to be a lot more challenging than just producing a video game version of Filmish. 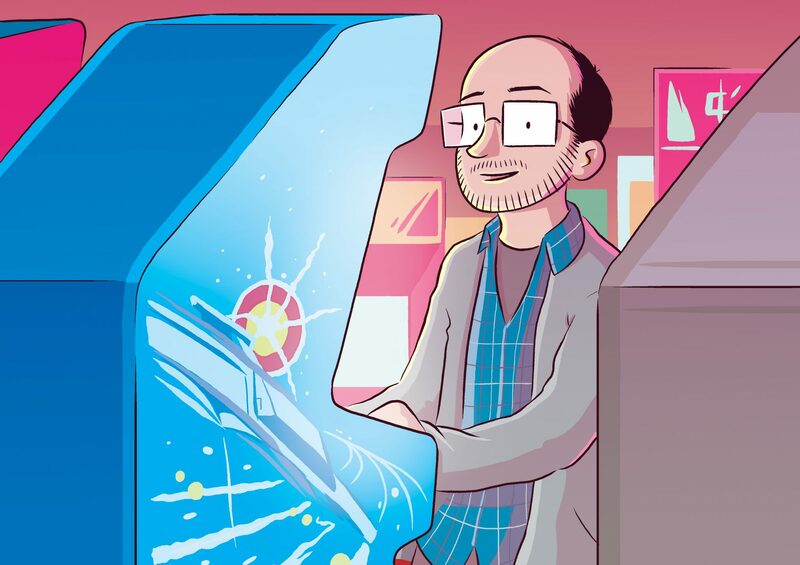 While video game history is just decades old (even if we’re generous it’s still only half the age of cinema), and video game theory still in its infancy, the history and theory of games and play goes right back to the dawn of humanity and beyond. In the first weeks of writing I was taking myself on a guided tour of Neolithic archeology. A month later it was ’60s tech counterculture, ’70s entrepreneurship. Every book and article I researched opened avenues to new ideas and thoughts, and quickly my plans for a swiftly written first draft disintegrated. After about three months I was hit with a huge bout of writer’s block – losing the will to write as all I could see was endless research ahead of me. But I listened to my better instincts, and after a few days of banging my head against a wall, I stepped away from the computer to recharge myself. I spent time with family and friends, went for some walks and even built some Lego. I came back mostly recharged and plowed on, but still it was slow going. The details of this thing were immense. Week on week I was having to delve into new fields of research – history, neurology, psychology, philosophy. It was exciting, but with every new set of ideas I’d have to spend hours or days reading around to get a grasp. Towards the end I was flagging, leaving gaps to be filled later, my structure becoming a muddle to be sorted later. But I know that I needed something complete. Something that would let me step out and see it from a new angle. To get some perspective. And that’s where I am now. It’s off with my editor and a couple of test readers. Soon I’ll be doing rewrites to plug the gaps, fix the structure, beef up the number of games referenced. Sometime later this year, I’ll be able to begin drawing, and a whole new adventure will begin. One of the biggest personal challenges I face as a creator is giving myself enough time and space to work on things that might not lead to any specific outcome. When I sit down to write or draw or research, it often feels like what I’m doing at any given moment must be essential to the outcome, or it’s not worth it. I find it really hard to step away from the frontlines of work and just spend time thinking. This drive to produce outcomes can be creatively draining. Not only this, but it prevents me from examining the work I’m producing and the decisions I’m making. When you’re in the trenches focussing on a series of very small problems, it’s easy to lose sight of what you’re wanting to achieve. By stepping back and spending some time reading around a subject, playing with ideas and approaches in my mind, and letting myself off the hook for not completing another few pages of writing, I actually do myself and my book a lot of good in the long term. Writing on Gamish is now well underway. I’ve reached the point, around the 1950s and 60s, when computer scientists were programming the first games. I think I could learn something from the programmers of that era. Employed to develop software for multimillion dollar computers, they spent their free time in play, seeing if they could make these machines into toys or musical instruments. With a sense of play, and a lack of pressure to produce results, this is where some of the best ideas come from. One of the areas I’m fascinated to explore in the book is the way games have been a part of human life throughout history. While they are often seen as merely entertainment, for me the strongest testament to the importance of games is that they have endured as an artform throughout human history. A game like Chess has spread across the world, crossing numerous cultural boundaries along the way. This game spoke to people like nothing else could – and it has survived for around 1,400 years because of this. You can easily imagine two people with a knowledge of chess, but separated by language, religion, culture, and even by a span of hundreds of years, being able to sit down together for a game of chess, and instantly connect through it. 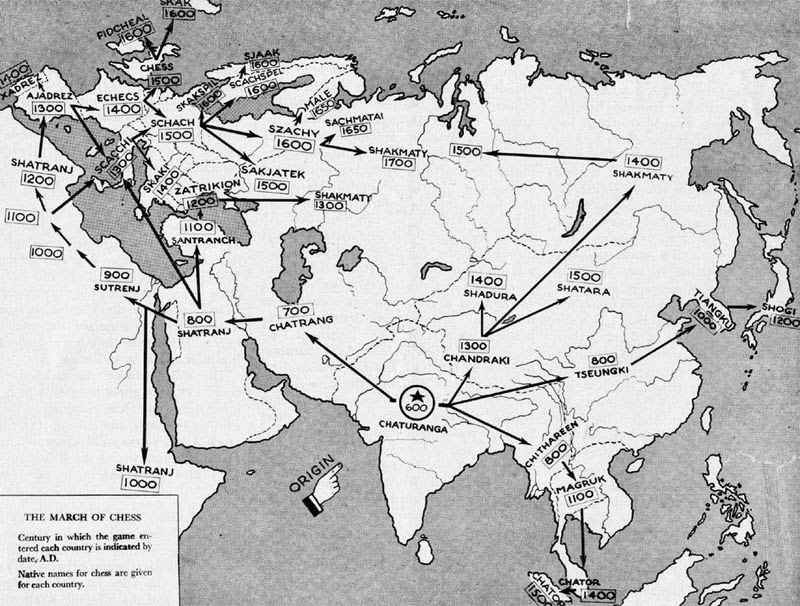 This fascinating map shows the spread of chess across the globe after its invention in India around 600 AD. The game evolved as it moved, the pieces gaining their current powers in Spain during the 15th Century. It’s also thought that precursors to chess spread to India from the East and influenced the creation of the game. Here I am at the very start of everything. It’s the comic book creator’s equivalent of that moment you bust open your new video game box, and after flicking through the instruction manual, slap the game into the console and launch the game. It feels like I’ve finally pressed start on this new project, and slowly this comic is going to be played to completion. A good eighteen months since my first graphic novel Filmish came out, and here I am back again at the beginning, about to launch into another graphic journey, this time into the fascinating history of gaming. Specifically, video games. Games have always fascinated me, but in a very different way to films. Games were always a little bit more out of reach for me. My older brother had a Spectrum ZX, later an Atari, and I would watch over his shoulder as he battled goblins in Golden Axe or dodged death in Mousetrap. I was too young to ever be that good myself, always taking great pleasure in the anticipation of play and then great disappointment when the game swiftly dispatched me and it was my brother’s turn again. As I got older, there were rarely consoles in the house, but always at my friends’ houses. It made games all the more appealing and mysterious. I could never master them like others my age, never obsessively complete the games again and again, but I was still hooked. I’d go home, playing through Goldeneye levels in my head, leaning into corners like in MarioKart. As a teenager, games became everything for a while. We’d play through Half Life together, squashed round a 14in monitor, each friend taking a key or button, allowing us to control Gordon Freeman by hive-mind. We’d mod up Operation Flashpoint and Quake, creating our own sound-effects and game modes. I got my first console, finally, at the age of 22. And here I started to engage more with the world of gaming – seeing perhaps for the first time the true potential of games as an artform. I’d play for hours on end, making the most of the freedom afforded by my mid-twenties. A few years later my gaming life got derailed by the birth of my son, and life took over. At first I’d try to sneak in cheeky sessions during naps, or after an abrupt 4am wakeup, but the dedication to regular gaming soon subsided. But the passion remained. Even through the busy job of raising two kids and creating my first graphic novel, it remained. And now, ready to work on my second graphic novel, an exploration of this amazing medium seems perfect. Games are at a key moment in their history – a tipping point where they are now finally being recognised for their huge and varied potential. Games are a major part of human life, and have always been with us – from their origins at the dawn of humankind through to the invention of video games and the evolution of the artform we know today. Like in my previous book, Filmish: A Graphic Journey Through Film, I’m going to use this book to explore all manner of interesting angles on my subject – looking at how games shape our understandings of race and gender, how they allow us to better understand the world we live in, and how they can change our lives for better or worse. This blog will run throughout production of the book, giving an insight into where I am at in production, what cool things I’ve been reading about, and maybe offering some reviews and recommendations of games I’m playing.